For the first time since 2003 the Maryland Terrapins are in the Sweet 16 of the NCAA Tournament. Now it was up to former point guard for the Jayhawks, Mark Turgeon, to lead the Terps to a win over his alma mater Kansas. After a first half that saw the Terps play some of their best basketball in months, fans were optimistic for a second half upset bid. Maryland was far from that as they got blown out by the number one overall seed. Melo Trimble struggled again, the offense was atrocious, and rebounding was again optional. It might not be a disappointing season, but Maryland did not take full advantage of their talent by falling 79-63 to Kansas. Filed Under: College Tagged With: Diamond Stone, JAKE LAYMAN, Kansas Jayhawks, MARK TURGEON, MARYLAND TERRAPINS, MELO TRIMBLE, RASHEED SULAIMON, Robert Carter Jr. When the Maryland Terrapins upset the then No. 3 Iowa Hawkeyes everyone thought it would be the Terps best win of the season. At that point in time it looked great but the Hawkeyes have been struggling more than Maryland recently by losing six of their last eight contests. 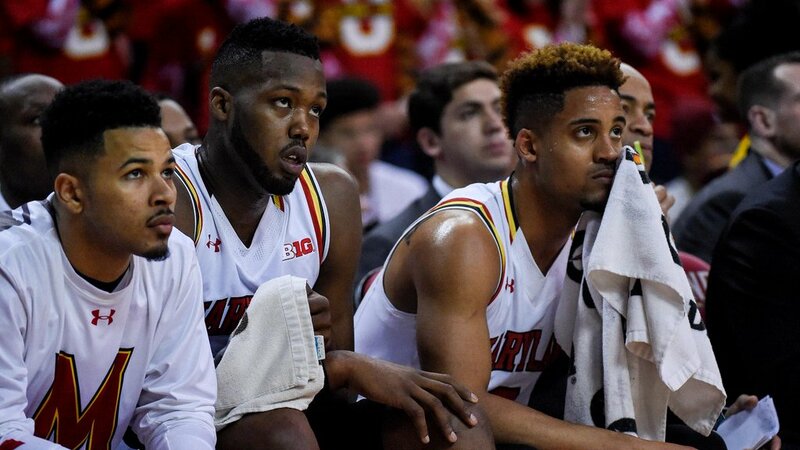 With the Terps being projected as a five speed in the NCAA tournament, a would-be huge disappointment, With the second best team in the country, Michigan State, next up in the Big Ten tournament, Maryland had a chance to climb up the seed line. Unfortunately, it looked like the Terps would get embarrassed early because of lack of transition defense. In the second half it was the “best we [Maryland] guarded in a longtime” according to Mark Turgeon which gave the Terps a chance, but a field goal drought of over 10 minutes doomed the upset hopes. With a drop in shooting percentage by a whopping 30 percent from yesterday’s record breaking performance, Michigan State squeaked past Maryland 64-61. The Maryland Terrapins caught a break in the quarterfinals of the Big Ten tournament when Nebraska, an eleven seed, upset Wisconsin, a six seed, in the second round despite playing the previous night. The downside is that they lost an opportunity to pick up a top-50 win against the Badgers while also avenging their only Big Ten conference home loss. If there was any question where Maryland was ready to start the postseason they quickly answered the bell to start the game on their way to a record breaking offensive performance. Mark Turgeon put it best after the game, “we did a lot of great things offensively tonight. First of all, we followed the game plan. We played inside out.” Despite a late scare, the Terps used their Big Ten tournament record 97 points in a game to get to the semi-finals with a 97-86 victory over Nebraska. The Maryland Terrapins are clearly not playing their best basketball; luckily they have a couple of short weeks to try and get back on track. 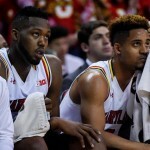 After losing to Purdue on the road, their third loss in the past four games, bracketologist Joe Lunardi has dropped the Terps to a four seed, a would be huge disappointment given the pre-season hype. 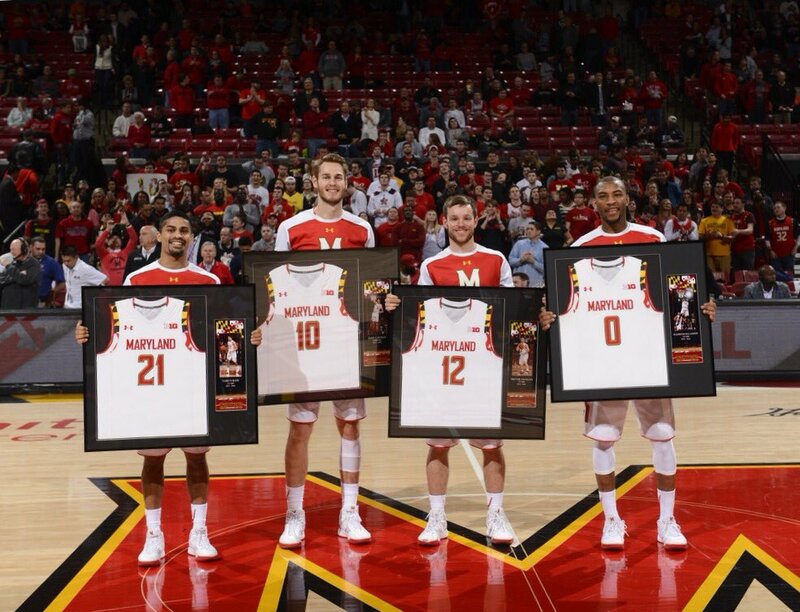 Following an emotional senior day presentation for starters Jake Layman and Rasheed Sulaimon as well as reserves Varun Ram and Trevor Anzmann it was pedal to the metal for Maryland. The Terps lead for the entire game, made a season-high 14 3-pointers, and saw all four of their seniors get playing time. The 81-55 victory was a “fun night” for the Terps according to their head coach in what could be a taste of what is to come. The highly touted freshman big only played nine minutes in the first half and sat the final five minutes after picking up his second foul. Instead of Damonte Dodd taking over as the Terps center, Turgeon opted to go small. Robert Carter Jr. slid to the rim protector position, while Layman moved to his future NBA position as a stretch-four power forward. With Jared Nickens returning back to non-conference form by hitting a couple 3-pointers, Maryland’s offense became more efficient. Turgeon continued to do the same in the second half, which clearly allowed more driving room from guards into the paint. As a part of the 3-point festivities, Maryland had a stretch where they came away with three triples after three possessions. Trimble started things off, Layman hit one after grabbing an offensive rebound, and then Nickens continued to look like his old self by burying one from deep to force an Illinois timeout. Maryland led by double digits the rest of the way. In a year where Maryland as narrowly escaped with victories against inferior teams, it was good to see them take care of business on their home floor. Turgeon explicitly credited Terp Nation, “I want to thank the fans” for the one-loss home record in back-to-back seasons. For only the second time during conference play Maryland shot better than 50 percent from 3-point range. With the recent struggles of Nickens and Melo Trimble, the Terps have had to rely on their defense to win games. Today was a completely different story as the home team drained a season-high 14 shots from the bonus-sphere. Nickens tied his season-high with four 3-pointers as he was freed up with cross court passes when Maryland bigs were doubled. When the Wrentham, Massachusetts native signed with the Terps nearly five years ago, Mark Turgeon frankly admitted that the team was not very good at the time. Although it is not right to have favorites, “Jake’s one of my all-time favorites … because he stuck with me” Turgeon revealed after the game. “Most proud of his development as a player … he’s become a more complete player” Turgeon elaborated on what he thinks is a first-round pick. Nickens told the stretch-four that he loved him after his final home game of the year. Layman did not call an 18 point, 7 rebound, and 3 assist game the story book ending, but it is as close of one as you are going to get. Going forward, his versatility to play power forward might be the key to the Terps making a deep run in the NCAA tournament. 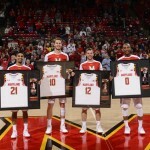 How many of the Terps played their last game at Xfinity? Jake Layman, Rasheed Sulaimon, and Varun Ram are all out of Division-I eligibility and obviously will not step onto the Xfinity hardwood next season. The next question is how many out of Melo Trimble, Diamond Stone, and Robert Carter Jr. will be lost to the NBA draft. The entire starting five lineup have the potential to be first round picks and the latter three are probably more likely than not to go pro. As Trimble came off the court for possibly the final time, students chanted “one more year.” I doubt any of the three have decided their future already because a lot of the way this season ends might affect their decisions. Maryland will finish their 2015-16 regular season by traveling to Bloomington to face the Big Ten regular season champion Indiana Hoosiers. The Terps have already clinched a double-bye in the conference tournament next week but can help their seeding with a road victory against a Top 25 school. Mark Turgeon did not believe today was a must win game, but it was clear that a third straight loss would be devastating to the Maryland Terrapins tournament seeding. After seeing their 27-game home win streak snapped at the hands of the Wisconsin Badgers and giving Minnesota their first conference victory of the season, the Terps delivered the first blow against Michigan. Maryland weathered the storm while the Wolverines made it rain from deep to secure a thrilling 86-82 victory against a tournament team. Maryland came out a little sloppy to start the game in the turnover department but their efficient offense was keeping they in it. Five minutes into the game things were tied at 10 a piece. The Terps bursted through with a 14-0 run, while Michigan went over seven minutes without a field goal. Turgeon believed it was the best stretch of basketball the program had played in “4 or 5 weeks” since the dismantling of Ohio State. Unlike the Ohio State game, the Michigan Wolverines fought back with 3-point shooting that cost Maryland the game in Ann Arbor. After taking control of things with a game high 16-point lead, 33-17, with 5:47 left to play in the first half, Michigan quickly went on a 13-2 run in the next three minutes. Maryland’s perimeter defense has been suspect for most of the year and it nearly cost them again today. The Wolverines finished 13 of 27 from beyond the arc and were killed by Michigan’s small stretch-four lineup while Turgeon wanted to stay big. The traditional Maryland bigs had a tough time guarding the likes of Mark Donnal and Kameron Chatman on the perimeter allowing 5 of 6 combing shooting. Michigan was still down five at halftime, but put together a 15-7 run after the break to take their first lead of the game since the opening minute. The usually raucous Xfinity Center crowd was stunned at the 13:55 mark with Michigan retook the lead. They were soon given something to cheer for as Melo Trimble hit a patented driving layup before Jake Layman drilled his third 3-pointer of the game off a loose ball situation. In less than a two minute stretch Maryland blitzed the Wolverines with an 11-2 run, but they could not quite close things out yet. Following a fade away Rasheed Sulaimon jumper, Maryland got cold from the field missing five of their next six shots with three turnovers sprinkled in. While Michigan was getting easy layup looks from Mark Donnal, repeatedly wide open under the basket following defensive rotations, they took their largest lead of the game (3) thanks to a 14-2 run. In the past three conference games combined, the Terps have only gotten eight points from their bench unit forcing the starters to play extended minutes. Today 18 points was good for the most points from the second unit in conference play since Diamond Stone joined the starting lineup. Damonte Dodd led the way with seven points, six rebounds, and two blocks, while Jaylen Brantley and Jared Nickens combined for 11 more points. Dodd had back-to-back blocks during the early 14-0 Maryland run in the first half and told me that the guards are confident that even if they get past them he can erase their mistakes at the rim. Brantley’s defense was superb with three steals, while it was nice to see Nickens knock down a couple of triples. In a game that Trimble would like to remember with seven turnovers, the bench arguably one this game. The Terps will have a nice six days of rest before having to travel to Purdue for a rematch with the Boilermakers. Maryland got a nice resume victory by beating Purdue two weeks ago and hope to repeat their success on Saturday, February 27th. 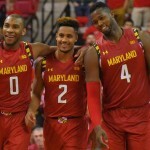 Filed Under: College Tagged With: DAMONTE DODD, Diamond Stone, JAKE LAYMAN, JARED NICKENS, Jaylen Brantley, MARK TURGEON, MARYLAND TERRAPINS, MELO TRIMBLE, Michigan Wolverines, RASHEED SULAIMON, Robert Carter Jr.
Maryland is coming off of a difficulty three game stretch in just seven days and are now rewarded with a non-conference matchup with Bowie State. Although it will be far from a quality win on the tournament resume, it gave the Terps an opportunity to play against a press and zone defense that has given them trouble over the past two seasons. As expected, this game was not close to being interesting as even the students did not care to come out in full force. In a taste of how the NBA game is transitioning, all of Maryland’s points came from in the paint (48), 3-pointers (12), or free throws (33). 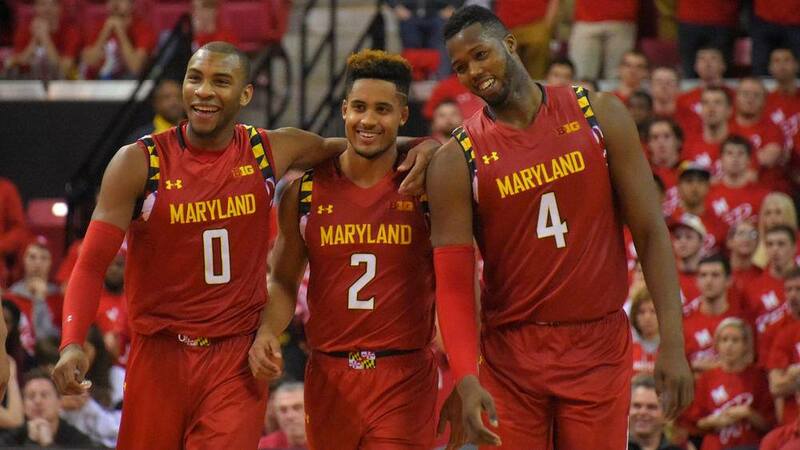 The Terps led from start to finish and improved to 22-3 on the season with a 93-62 victory. Fresh off of their best win of the season, against No. 3 Iowa, the Maryland Terrapins were looking to make their return to a projected one or two seed. Even after hitting the century mark in College Park against the Ohio State Buckeyes, the Terps are on a two-game skid on the road: Michigan and Michigan State. Maryland had a strong showing at the end of the first half, but a cold stretch to start the second allowed Ohio State to get back into things. Back-to-back 3-pointers late in the game gave the Terps the cushion they needed to survive on the road against Ohio State, 66-61. Filed Under: College Tagged With: JAKE LAYMAN, JARED NICKENS, MARK TURGEON, MARYLAND TERRAPINS, MELO TRIMBLE, Ohio State Buckeyes, RASHEED SULAIMON, Robert Carter Jr.